The 5DT Virtual Binoculars are aimed at VR applications and simulations where binoculars are used to obtain a magnified view, e.g. ship bridge simulators, small arms shooting simulators, virtual observation posts, Air Traffic Control (ATC) tower simulators and virtual laser rangefinders and designators. 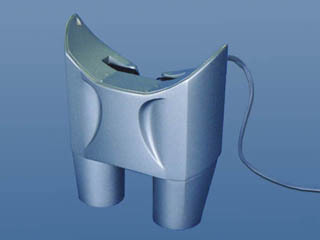 The system features a futuristic and ergonomic design. Magnetic or inertial head trackers may be fitted into the system. A camera-mount block for a tripod mount may be supplied.